This next entry of FAMOUS MONSTERS MEMORIES contains six more covers with a brief synopsis of what's inside. Also, selected issues have their back covers displayed. Some of these show off some cool items I'm sure some of you older FMOF fans out there probably spent your allowance on! This is issue number 38 of Famous Monsters and it features articles on INVASION OF THE SAUCER MEN (1957), CURSE OF THE DEMON (1957) and HERCULES & THE PRINCESS OF TROY (1965). Also the concluding movie book for 20 MILLION MILES TO EARTH (1957) concludes in this issue. Vic Prezio painted this exceptional cover. I never got the chance to see SAUCER MEN and this issue has some interesting behind the scenes shots of that film being made. DEMON I caught up with in the mid 80's courtesy of the Goodtimes VHS. The Hercules film I saw on TNT on New Years Eve late one evening. The print was immaculate. A shame some of the DVD versions look terrible. It was the pilot for an aborted television series. The great Gordon Scott starred. This is issue 39 from 1966 featuring another Vic Prezio cover this time depicting Frankenstein's monster from the US-Japanese co-production, FRANKENSTEIN CONQUERS THE WORLD. This issue is loaded with pics (many publicity photos) from the Ishiro Honda film. Another FRANK film is also featured--FRANKENSTEIN MEETS THE SPACE MONSTER (1965). Some interesting info has an anecdote from John Astin regarding his signing of a 5 year contract for THE ADDAMS FAMILY. "The producers are optimistic about the show." It only lasted two seasons. Also, there's a blurb from Vincent Price stating that since his comedy, DR. GOLDFOOT & THE BIKINI MACHINE was such a success, he isn't doing anymore horror films till a good one comes along! He wouldn't appear in another horror film until 1968's WITCHFINDER GENERAL and that's definitely a good one! Issue number 40 from August 1966 represents a horrible discovery in the HORROR HOTEL (1960) as its cover. This artwork is from Ron Cobb. Cover stories include HORROR HOTEL, THE SHE CREATURE (1956), DINOSAURUS! (1960), the upcoming THE DEADLY BEES (1967) and a comic strip version of THE MUMMY'S HAND (1940). One of the news bites reports that Brian Donlevy marries one of Bela Lugosi's ex wives. 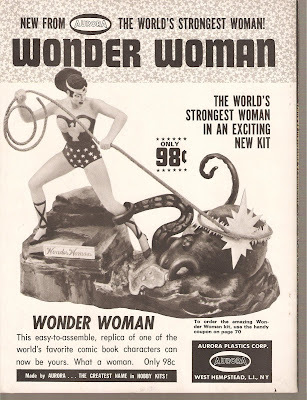 Wonder Woman battles a huge octopus in one of many Aurora model kits. Next is issue 41 featuring an in depth article on THE WEREWOLF OF LONDON (1935). A splashy preview of Hammer's CURSE OF THE MUMMY'S TOMB (1964) is also featured. There's a news bite about the Warner film, CHAMBER OF HORRORS (1966) being expanded into a theatrical feature as opposed to its originally intended TV movie status. There's also a blurb from an excited Sharon Tate in regards to her last movie, FEARLESS VAMPIRE KILLERS (listed here as VAMPIRE KILLERS). MUNSTERS, GO HOME! (1966) is also featured here. 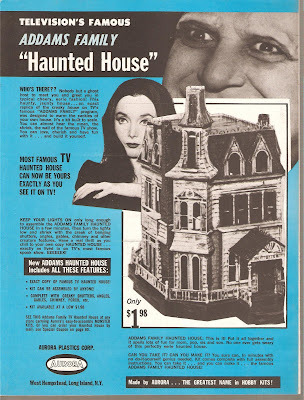 A very nice recreation of THE ADDAMS FAMILY mansion here for "Only $1.98!" Issue 43 from March 1967 doesn't impress me much with this comical rendition of Chris Lee's Dracula by Ron Cobb. Cover stories of FANTASTIC VOYAGE (1966), the Danish import, JOURNEY TO THE 7TH PLANET (1962). Some news bites include Lloyds of London insuring Elizabeth Montgomery's nose for $1 million(!) after she was involved in a five car pile up! Montgomery smashed up her nose in the accident. A funny quote from Stanley Kubrick says, "I'm sure there's intelligent life on other planets. To prove they're intelligent, they haven't visited Earth." Willis O'Brien performing his stop motion effects work and HOUSE OF DRACULA (1940) are also featured in this issue. 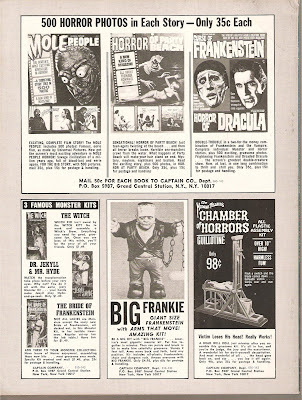 Some very cool monster movie photo books and dig that 'Chamber of Horrors' guillotine! Only .98! Finally, we get to issue 45 from July 1967. The cover ghoul is by Ron Cobb. The films featured are THE PROJECTED MAN (1966), RETURN OF THE VAMPIRE (1944), DR. BLOOD'S COFFIN (1961) and HOUSE OF WAX (1953). The usual great collection of monster photos and upcoming fright features compliment this issue. 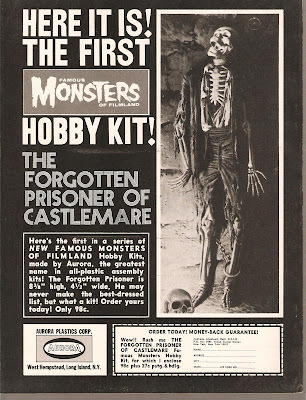 It's the first ever Famous Monsters of Filmland model kit through Aurora. A reporter anticipates the arrival of a famous doctor, Professor Hagenbeck, at the airport. An unknown military plane without clearance makes an emergency landing on the air strip. Suddenly, a group of disfigured individuals emerge and begin massacring the personnel. Almost immediately an epidemic of mass murder breaks out as the burnt faced, blood drinking creatures systematically lay siege to the city killing anyone they come across. Reporter, Dean Miller and his wife make a dangerous trek through the city in an attempt to make their way to safety. They encounter a maniacal motley crew of savage, blood hungry killers at every turn. The versatile Italian director, Umberto Lenzi, helms this curiously chastised, yet lovably nauseating and violent horror picture. For years it's been labeled as a zombie movie, although Lenzi displays annoyance whenever it's referred to as such. He even stated in an interview that he altered the script himself in an effort to remove the elements that linked the production as being another zombie film. Nonetheless, the look of the monsters and the means to kill them keeps it firmly entrenched within zombie parameters. Taken under those guidelines, it could be viewed as the forerunner to the (now tired) 'running zombie' movies that found success with RETURN OF THE LIVING DEAD (1985). This type of zombie characteristic really hit the ground running (haha) with the release of the British production, 28 DAYS LATER (2002). With NIGHTMARE CITY, Lenzi directs his film with a lot of zest and keeps things moving at a rapid fire clip. The producer wanted a traditional zombie movie, but Lenzi objected and wanted to mold the film on the Seveso incident that occurred in July of 1976. That terrible accident took place at a chemical manufacturing plant in Italy when dangerous levels of tetrachlorodibenzo-p-dioxin were released into the air. Aside from the blood drinking creatures seen in Lenzi's action horror opus, the script mirrors the events that took place in Italy, July of 1976. Areas were quarantined, people were diagnosed with skin inflammation and lesions. Thousands of animals were quickly exterminated in an effort to stop the spread of the dioxin. For years thousands of people ultimately suffered from the exposure to the deadly gas. Much of the chaos could have been prevented had the situation been handled with a lot more care and awareness. Even still, Lenzi's film ultimately focuses more on the sensational aspects of the script. His desire to make a parallel with the deadly gas leak in '76 is lost among dozens of nasty scenes of gore and violence. The Seveso connection is made particularly apparent during the opening scene immediately after the credits. A news report speaks of a mysterious radioactive spill at a nearby nuclear power plant. Also, the Seveso incident is subtley referenced during the gas station sequence where Stiglitz and actress, Laura Trotter have holed up in. Trotter makes a speech about how "this whole thing could have been avoided", and how "we are to blame". Aside from that and the chemical that has turned the people into raving mad monsters being a reference, the movies violence totally overpowers any such environmental message Lenzi had hoped to get across. Action and violence are Lenzi's forte and he doesn't disappoint. Heads are split open, breasts are removed, eyes gouged out, throats are slit and bodies riddled with bullets are some of the highlights. While some of Lenzi's intention survives, the producers vision won out as NIGHTMARE CITY (1980) has, and always will be regarded as a straight up 'zombie' movie; mean spirited entertainment and nothing more. It's incredibly violent, but contains some unintentionally hilarious moments such as a doctor who can throw a mean scalpel when the zombie/vampire creatures interrupt surgery while laying waste to a hospital. These creatures, despite requiring a continuous supply of plasma to sustain themselves and their rapidly depleting red blood cells, have lost none of their mental faculties. They form groups, plan attacks and frequently manage to overpower and outsmart armed military forces. Shooting them in the head is the only surefire way to put an end to these crusted oatmeal faced monsters and the camera lovingly lingers on any sequence that features shots of extreme gore and gruesome violence. Although I would assume it had a low budget, the film has a much bigger scope than normally afforded the Italian zombie pictures. Whatever the case, Lenzi was perfectly at home directing large scale films with action (Check his two SANDOKAN films from the early 60's with Steve Reeves as well as his war pictures) and NIGHTMARE CITY contains plenty of that. According to producer Claudio Fragasso, the trash favorite, HELL OF THE LIVING DEAD (1980) was also supposed to have been a much bigger enterprise told on a grand scale. But Bruno Mattei is definitely no Umberto Lenzi! One could also argue that, because of this scope, NIGHTMARE CITY (1980) is a horror war picture of sorts. A major metropolitan area is invaded by a slew of deranged, mutated creatures, who in turn, create even more bloodthirsty monsters. The military struggles to contain them while the central characters attempt to escape the hostile city with their lives. There's several gun battles between the military and the mutants including one where the creatures infiltrate a military guarded power installation. The armed forces are also shown in an almost powerless state being unable to quell the spread of the "infection". A helicopter pilot refers to the blood gurglers as "infected" during the finale, that term being reserved for some of the recent spate of "zombie" movies. When the "zombies" attack, they do it on a grand scale. Lenzi's penchant for action is put to good use here and melds sadistically well with the gruesome sequences. As usual with most Italian horror pictures, it's also hopelessly misogynistic. Even more so given the larger number of kills in the movie. When the men are killed, they generally get a stab in the gut or their throat cut. The women get stabbed multiple times, have their breasts sliced off, eyes gouged and their shirts torn away; Oftentimes a mixture of the above. Lenzi is also successful in creating several scenes of genuine suspense. One of note has Rabal call his wife played by Maria Rosaria Omaggio. Telling her to lock the doors and stay inside, she does so, but hears the lawnmower running out back. Exiting the back door, she sees the lawnmower running by itself! There is a general sense of isolation and dread created here as streets suddenly seem empty and bereft of life. This leads to a bizarre, yet creepy scene immediately thereafter. Sheila returns inside the house and hears a noise in another room. She finds a sculpture she was working on is now on the floor with a bloody knife stabbed through its eye! Later in this sequence after taking in her terrified neighbor, it becomes increasingly obvious that the two women are not alone in the house. Lenzi further explores the frightening aspects of a city in hysteria as gradually the military lose control of the situation leading to streets stricken with corpses and blood hungry, radioactive humans. There's also a great scene where Francisco Rabal lands his helicopter at an air base after the order was given to bomb the infected areas. He lands only to discover that none of the planes have taken off. Everyone is dead. Murchison is then informed that a chemical has been created that kill the creatures from the sky, fired from the missile launchers of fighter planes. This plan proves useless as there's nobody alive to fly them! Some reviewers have issues with the films ending citing it as a copout. I don't see it as such. The title of the movie, both the original Italian and the English title of "NIGHTMARE CITY" alludes to what happens during the closing moments. Still, the scene that preceeds the last scene is quite exciting as well as shocking in regards to one of the films main characters. Lenzi was a master at hammering you over the head with grim scenes of extreme violence. He's so good at this, you could watch just about any film of his not knowing who the director was and be able to tell Lenzi's style at some point during the feature. According to Lenzi, this Italian-Spanish co-production (aside from the participation of Stiglitz, Mexico apparently had a financial interest in the film despite the credits only mentioning Italy and Spain) shot for three weeks in Rome and five weeks in Spain. There are several rather big names in the cast, too. Lenzi was good friends with Mel Ferrer and cast him here as General Murchison. He also used him in another of his films, the craptacularly entertaining cannibal movie, EATEN ALIVE! also from 1980. Francisco Rabal (THE REBEL) and spaghetti western villain veteran Eduardo Fajardo (DJANGO) also have roles in Lenzi's manic radioactive monster movie. Lenzi didn't like having Hugo Stiglitz as the lead in this production. He had nothing against him personally, he just felt he didn't bring the passion he wanted from him for the role. Considering he was a known leading man in Mexico, the financiers made it a requirement that he participate. By his own declaration, Lenzi would have liked to have secured the services of either Franco Nero or Fabio Testi. I would guess, though, that Nero would have turned the offer down considering the level of violence inherent in the script. Umberto Lenzi is very passionate about his movies and enjoys discussing about their making. Judging by some interviews I've read with him, he seems tend to get irritated that most people seem to only want to talk about his films like NIGHTMARE CITY. He is often accused of being snobbish and arrogant, but to me, he seems like a young boy again when discovering there is a renewed interest in his movies. Although some of his statements can get wildly outrageous at times, he none the less is proud of his work. Furthermore, the director does tend to prefer his giallo, crime and war pictures (PARANOIA '69, BATTLE OF THE COMMANDOS '69, VIOLENT NAPLES '76 are some of the films closest to Lenzi's heart) over his more famous violent horror pictures. His supposed swollen ego and outlandish remarks aside, Lenzi is very much aware that these more widely discussed pictures are not important films despite their success. But are minor films on his resume and should be seen as entertainment. NIGHTMARE CITY (1980) is a wild and bloody exercise in excess. The movie has its fans as well as its fair share of detractors. I think it's an odd amalgamation of themes and ideas given a much larger scope than normally afforded these movies. It's neither Lenzi's best and far from his worst. It's a favorite of mine and sports a great deal of ultra violent entertainment value for shock seekers and gore mongers alike. This review is representative of the region 0 PAL Italian Shock DVD; the pics are from the Anchor Bay release.